San Juanico Bridge (Filipino: Tulay ng San Juanico and Spanish: Puente de San Juanico) is part of the Pan-Philippine Highway and stretches from Samar to Leyte across the San Juanico Strait in the Philippines. Its longest length is a steel girder viaduct built on reinforced concrete piers, and its main span is of an arch-shaped truss design. Constructed during the Marcos administration using Japanese Official Development Assistance (ODA) loans, it has a total length of 2.16 kilometers (1.34 mi) - the longest bridge spanning a body of seawater in the Philippines. Touted as President Ferdinand Marcos' "birthday gift" to his wife Imelda, it was one of the high-visibility foreign-loan projects initiated by Marcos during the run-up to the 1969 Presidential election campaign. Completed four years later, it was inaugurated on 2 July 1973 - Imelda Marcos' birthday. Upon its completion, economists and public works engineers quickly tagged it as a white elephant which was "constructed several decades too soon", because its average daily traffic (ADT) was too low to justify the cost of its construction. As a result, its construction has been associated with what has been called the Marcoses' "edifice complex". In the decades after the Marcoses administration, economic activity in Samar and Leyte has finally caught up with the bridge's intended function, and it has become an iconic tourist attraction acknowledged as "part of the identity of people in Samar and Leyte." The "Philippine-Japan Friendship Highway Bridge" was part of a large bundle of high visibility foreign-loan-funded infrastucture launched by Ferdinand Marcos' administration in the during the 1969 Presidential campaign. These foreign-loan-funded showcases, which also included the Cultural Center of the Philippines, allowed Marcos to credit the projects as part of his administration's "performance" - part of the reason he became the first and only President of the Third Philippine republic to win a second term. At the time the project was conceived, there was not yet much traffic between the islands of Leyte and Samar because they were relatively underdeveloped, As a result, there was not yet a need for such a costly project funded by foreign loans which would charge interest. But the bridge was built there because Imelda Marcos, who had grown up in Leyte, wanted a bridge for her province. The Philippine-Japan Friendship Highway project started out in the mid-1960s with a single USD 25 million Japan Export-Import Bank loan meant for the purchase of equipment for road development. But the Marcos administration requested its expansion to incorporate a bridge between Leyte and Samar, and various sea traffic projects such as roll-on/roll-off ferries. The cost of the construction was US$22 million (about ₱140 million), which was acquired through Official Development Assistance loans from Japan's Overseas Technical Cooperation Agency (OTCA), the predecessor of today's Japan International Cooperation Agency (JICA). This was the first Official Development Assistance from Japan to the Philippines through JICA. Through the then Ministry of Public Highways, the Philippine government contracted the San Juanico Bridge project to the Construction and Development Corporation of the Philippines (CDCP; now the Philippine National Construction Corporation), a company founded by close Marcos associate Rodolfo Cuenca. Construction of the bridge commenced during 1969 presidential campaign. It was finally completed four years later, in 1973. It was inaugurated on July 2 - in celebration of Imelda Marcos' birthday. Its design reflected the aesthetic of other infrastructure projects associated with what has been called the Marcoses' "edifice complex," - described by Architectural historian Gerard Lico as "an obsession and compulsion to build edifices as a hallmark of greatness." Aerial view of the bridge in 2012. The bridge was slightly damaged by Typhoon Haiyan, locally known as Super Typhoon Yolanda, in November 2013 but was quickly repaired and reopened within the month. Samar Governor Sharee Ann Tan proposed a project to install LED lights in the bridge, with timed lighting effects for select occasions as an effort to boost tourism between Leyte and Samar islands. The ₱80 million project dubbed as the San Juanico Bridge Lighting Project was approved by the Tourism Infrastructure and Enterprise Zone Authority in January 2018. While delayed, the lighting project is projected to be completed in 2019. The San Juanico Bridge at night. San Juanico Bridge connects the islands of Leyte and Samar by linking the city of Tacloban to the town of Santa Rita, Samar. It passes over the San Juanico Strait. The road infrastructure is the longest bridge in the Philippines spanning across a body of water measuring 2,164 m (7,100 ft) in total length. It has 43 steels spans with the primary span measuring 192 m (630 ft). The bridge's abutments are founded on steel H-piles while its piers are rock seated pedestals built using the Prepakt method, having single cylindrical shafts and tapered cantilevered copings. The bridge is part of the Pan–Philippine Highway (commonly known as the Maharlika Highway), a network of roads, bridges, and sea routes that connect the islands of Luzon, Samar, Leyte, and Mindanao in the country. The highway was proposed in 1965, and constructed under the administration of the late President Ferdinand Marcos to serve as the country’s backbone of transportation. The bridge is considered by the government as a main tourist destination of the Tacloban. San Juanico bridge also serves as an important role for both the tourism and economies of the islands of Samar and Leyte by linking them. During martial law in the Philippines under then-president Ferdinand E. Marcos, Military personnel who conducted tortures referred to one particular method of torture as "the San Juanico Bridge." It involved a person being beaten while the victim's head and feet lay on separate beds and the body is suspended as though to form a bridge. Filipino actor and stunt performer Dante Varona jumped from the San Juanico Bridge without a harness in the 1981 movie Hari ng Stunt. The short story "The Bridge" by Yvette Tan is based on one of the urban legends surrounding the San Juanico Bridge. The story won an award for fiction from the Philippine Graphic. There are a number of urban legends associated with the bridge’s construction. The most popular one involved a woman who follows a fortune teller's advice and orders workers to mix children’s blood with the bridge’s foundation. A river fairy curses the woman and causes the woman to grow foul-smelling scales on her legs. On September 22, 2002, a barge rammed into a concrete foundation of the bridge causing a ₱25-million damage. Then, on October, A portion of the bridge slid down by at least 10 centimeters after a metal support for its concrete foundation gave way, which was attributed by Engineer Jimmy Chan to "material fatigue. On January 2003, a passenger van, traveling from Borongan, Eastern Samar, fell off killing the driver and one of the four passengers. On June 21, 2013, a driver was killed and a passenger was injured when the cargo truck carrying them fell off. They came from Tacloban headed to Catbalogan when the truck’s brakes malfunctioned and swerved out of control. While doing an aerial survey in December 2013, nearly a month after Typhoon Yolanda hit the Philippines, a Chinese humanitarian team helping in the relief operations reported there were still dead bodies floating around the bridge. ^ a b "60 Years of Japan - Philippines Cooperation (Commemorative Magazine)" (PDF). Makati, Philippines: Japan International Cooperation Agency Philippines Office. Archived (PDF) from the original on 3 July 2018. ^ a b c d e f g Landingin, Roel R. (13 February 2008). "7 in 10 ODA projects fail to deliver touted benefits". Philippine Center for Investigative Journalism. Archived from the original on 12 October 2009. ^ a b c "ASEAN Dialogues: Former Philippines Premier Virata Looks Back on Decades of Working with Japan". www.jica.go.jp. Japan International Cooperation Agency. Archived from the original on 30 June 2018. ^ a b c Quirante, Ninfa Iluminada (13 March 2018). "San Juanico Bridge, a symbol of love". Philippine Information Agency. Retrieved 26 March 2018. ^ a b Fifty years of Japan ODA : a critical review for ODA reform: Reality of Aid Asia-Pacific 2005 report. Manila: IBON Books. 2005. ISBN 978-971-0325-52-8. OCLC 68191461. ^ a b c d Sabornido, Lyza (17 September 2014). 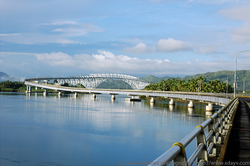 "10 Facts You Should Know about San Juanico Bridge in Samar and Leyte". FAQ.ph. Retrieved 26 May 2016. ^ Guia, Jhaypee (13 July 2012). "Go Across the San Juanico Bridge". Vigattin Tourism. Archived from the original on 31 January 2014. ^ a b c Ricardo., Manapat, (1991). Some are smarter than others : the history of Marcos' crony capitalism. New York: Aletheia Publications. ISBN 9719128704. OCLC 28428684. ^ a b Afinidad-Bernardo, Deni Rose M. (2016). "31 Years of Amnesia: Edifice Complex". The Philippine Star. Archived from the original on 4 March 2017. ^ a b c d "Edifice Complex: Building on the Backs of the Filipino People". Martial Law Museum. Archived from the original on 1 May 2018. ^ a b "It Takes a Village to Loot a Nation: Cronyism and Corruption". Martial Law Museum. Retrieved 1 May 2018. ^ a b c TIEZA (25 March 2018). "San Juanico, Eastern Visayas' iconic bridge, to be lit up by end of 2018". Philippine Information Agency. Retrieved 26 March 2018. ^ Santos, Roselle. "Book Review: Edifice Complex: Power, Myth, and the Marcos State Architecture by Gerard Lico : Philippine Art, Culture and Antiquities". Artes de las Filipinas. Retrieved 1 May 2018. ^ Fensome, Alex (11 November 2013). "Filipinos' nervous wait as toll soars". The Dominion Post. Stuff Limited. Retrieved 13 November 2013. ^ "Protection Assesment: Super Typhoon Haiyan (Yolanda)" (PDF). United Nations High Commissioner for Refugees. Retrieved 26 March 2018. ^ Meniano, Sarwell (28 August 2018). "Detailed technical review delays San Juanico Bridge lighting project". Philippine News Agency. Archived from the original on 27 November 2018. ^ "Region VII – Central Visayas Region" (PDF). DPWH Annual Report. Department of Public Works and Highways: 46. 2015. Retrieved 26 March 2018. Rehabilitation of San Juanico Bridge (2.164 km. ), P1.002 Billion. ^ "Tacloban: A Fast Rising Highly Urbanized City A City Profile" (PDF). National Statistical Coordination Board : Regional Division VIII. Retrieved 26 March 2018. ^ Laber, Jeri (30 October 1976). "Philippines Torture". The New York Times. p. 23. ^ Pedroso, Kate (21 September 2014). "'San Juanico Bridge,' other tortures detailed". The Philippine Daily Inquirer. Archived from the original on 21 September 2014. ^ Hapal, Don Kevin (23 February 2016). "Worse than death: Torture methods during martial law". Philippines: Rappler. Retrieved 1 May 2018. ^ Robles, Raissa (2016). Marcos Martial Law: Never Again: A brief history of torture and atrocity under the New Society. Quezon City: Filipinos for A Better Philippines, Inc. ISBN 978-621-95443-1-3. OCLC 952277519. ^ "They are not stuntmen like Dante Varona". Leyte Samar Daily News. 7 August 2014. Retrieved 1 May 2018. ^ a b Albano, Lou (8 October 2009). "Q&A with Palanca Awardee Yvette Tan". FHM Philippines (Summit Media). Archived from the original on 1 May 2018. ^ Casocot, Ian Rosales (14 August 2009). "Yvette Tan's Waking the Dead". The Spy in the Sandwich. Retrieved 1 May 2018. ^ Piccio, Belle (27 October 2015). "Urban Legend: The Bloody Secret of the Longest Bridge in the Philippines". Choose Philippines. Archived from the original on 29 October 2015. ^ "Metal support in San Juanico's pier gives way". Philstar. Retrieved 17 September 2018. ^ "Van falls off San Juanico Bridge; 2 dead". Philstar. Retrieved 18 September 2018. ^ "Driver killed as truck falls off San Juanico Bridge". inquirer.NET. Retrieved 18 September 2018. ^ "Driver killed as truck falls off San Juanico Bridge". ABS-CBN News. Retrieved 18 September 2018. ^ Zofia L (4 December 2013). "120 Bodies Found Under San Juanico Bridge". Kicker Daily News. Retrieved 20 September 2018.